Here’s a twist on a classic Mexican dish that’s unbelievably satisfying and delicious. 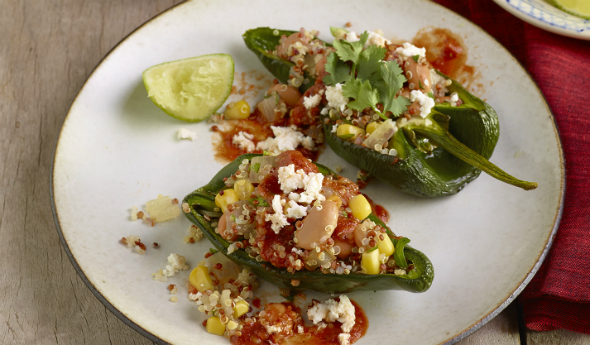 Roasted poblano chiles are stuffed with a fabulous combination of quinoa, pinto beans, onion, corn and cheese. They’re topped with a savory sauce, sprinkled with cheese and baked for 15 minutes. This meal is a fiesta of flavor that can’t be beat! Set the oven to 450°F. Heat the quinoa and 1 1/2 cups broth in a 2-quart saucepan over medium-high heat to a boil. Reduce the heat to low. Cover and cook for 15 minutes or until the quinoa is tender. Spoon the quinoa into a large bowl. Let cool. Place the poblano chile halves into another large bowl. Add 1 tablespoon oil and toss to coat. Arrange the chile halves, skin-side down, on a baking sheet. Roast for 15 minutes or until the chiles are tender and the edges are lightly browned. Let the chiles cool on the baking sheet on a wire rack. Reduce the oven temperature to 375°F. Heat the remaining oil in a 10-inch skillet over medium heat. Add the onion and cook for 5 minutes or until tender-crisp, stirring occasionally. Stir in the corn and beans and cook until the mixture is hot. Stir the onion mixture into the quinoa. Stir in the cilantro. Spoon about 1/4 cup quinoa mixture into each chile half, mounding slightly. Place the stuffed chile halves onto a baking sheet. Bake for 15 minutes or until the stuffed chiles are hot. Place the tomatoes, chipotle peppers, garlic and remaining broth into a food processor. Cover and process until the mixture is smooth. Pour the tomato mixture into a 2-quart saucepan. Cook over medium-high heat for 15 minutes or until the sauce is thickened. Season to taste. Transfer the stuffed chiles to a serving plate. Spoon the sauce over the chiles, sprinkle with the queso fresco and additional chopped cilantro, if desired. Serve with the lime wedges.